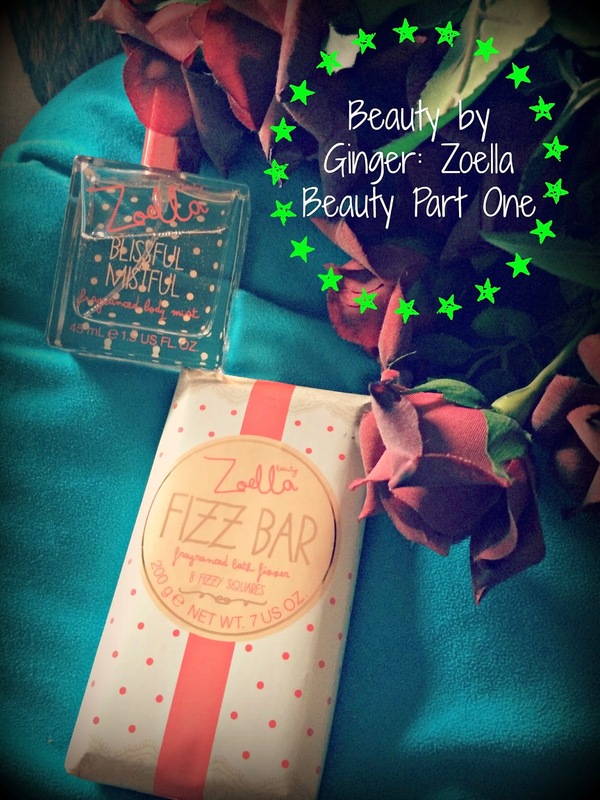 I'm sure I don't need to tell you about the recent launch of Zoella (Zoe Sugg's) very own beauty line - Zoella Beauty - do I? ...When I could actually get hold of some. When I went to check the stock on my go-to beauty website FeelUnique.com, everything from Zoe's line had completely gone. Luckily, I was able to quickly pop a couple of products in to a virtual shopping basket on Superdrug.com, and, with baited breath, I waited for them to arrive. The first product I went for was Fizz Bar. It was the concept that intrigued me the most. If you know me or have been with Just Add Ginger for a while you will know I am a die-hard Lushie. But with a wedding to plan for, my trips to the candy shop of pamper products has to be limited (Waa!) Fizz Bar really sang to me because of the multiple-use design. 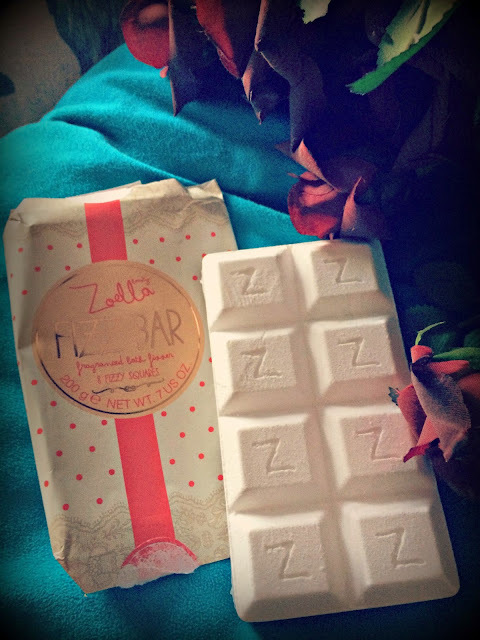 Not only does it come in very cute (and quintessentially Zoella) packaging, but the Fizz Bar is designed like an eight-squared chocolate bar. You can break off as many chunks off as you want to use in the bath, and keep the rest for another day. And all this for around the price of a Lush bath ballistic.... I had to give it a try! I'd never abandon Lush - no way - but this seemed like a more budget friendly option. The scent of Fizz Bar is light and a mix between floral and citrusy (flitrusy....cloral?!) It is not overbearing, and definitely appeals to those of out there who prefer the lighter fragranced beauty products. I first tested out Fizz Bar using one "chunk," and to be honest, it just wasn't enough. It fizzed and bubbled happily enough in the bath, and turned the water a slightly milky colour, but the scent didn't come through at all. To be fair, it does suggest to use one OR two cubes of Fizz Bar, so in the spirit of giving it a fair shot, the second time I used it, I used two chunk to see if that made a difference. This worked a bit better. The water turned milky, and whatever was in Fizz Bar made my skin feel really smooth, but I still couldn't smell anything. I don't know if that is what is meant to happen, but personally, I like a really highly- scented bath ballistic. They are such a novel thing for me to buy that when I invest, I want the excitement of a lovely smell.... Glitter.... Bright colours.... Dried flowers.... Something to make me feel really pampered, and Fizz Bar just did not pack enough punch for me in that department. Fizz Bar did leave my skin feeling lovely and soft and nourished though, and for that, I was really impressed, and very happy! There's no better feeling that having soft and supple skin, especially in these Autumnal months as the weather gets colder and skin gets unhappier. But is it enough to make me repurchase Fizz Bar? No. Probably not. Don't get me wrong, I think the concept of the chocolate bar design for Fizz Bar is excellent and so innovative, and if I was a bit younger and on more of a budget, I think I would invest again because you get so much use out of one bar. But for me, I want more out of my bath products. I don't know if that is because I am older, and have a more informed preference, or if it's just because I am so much of a Lush fan. But either way, whilst I'm glad I bought Fizz Bar and showed my support for Zoella Beauty, Fizz Bar has not knocked my love of Lush off it's pedestal. What I will say though, is that if you are looking for a new, gentle and pampering budget-friendly bath product to try that you can use multiple-times, and that leaves your skin feeling soft, give Fizz Bar a go. Just because it didn't tick all the boxes for me, it doesn't mean it won't for you. And with Fizz Bar retailing for £5.00, it'd make the perfect Christmas present or stocking filler for the upcoming festive season too! 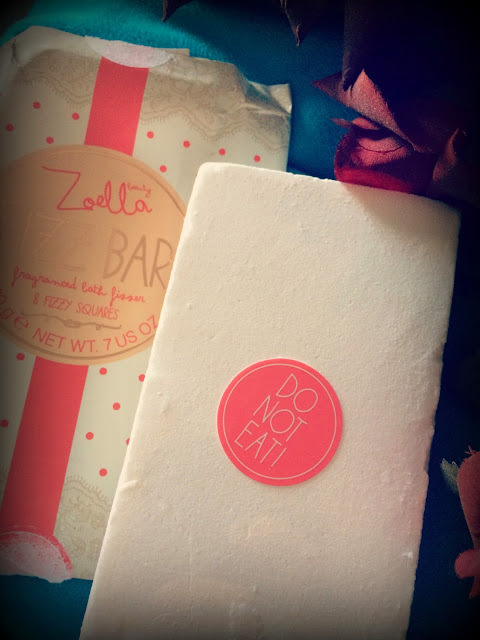 Have you tried anything from the Zoella Beauty line?